A special thread from Assam mounted onto the handloom along with thickened silk from Patna, the skillful hands of a Kashmiri artisan and the locally-recreated-designs from Hamadan, is what goes in the making of a Kashmiri Kaleen. Hussain Danish reports. A magnificent symbol of Kashmiri handicrafts for ages, Kashmiri Kaleen has won artisans in Kashmir a name worldwide and many prizes. And it continues to entice admirers of art into buying one of the most expensive pieces of handicraft. The tedious job of Kaleen weaving begins with the learned artists drawing on paper the mesmerizing designs, which are then crafted on the delicate-mixture of silk and thread. It takes several men, differently skilled, months or even years, defined by the spread and pattern of the carpet-to-be-made, to produce a single piece of art. The non-native craft of Kaleen Bafi (carpet weaving) travelled to Kashmir from Hamadan in Persia (now Iran) with the revered Sufi saint, Mir Syed Ali Hamadani. It is believed that Shah-I-Hamadan brought with him skilled artisans who diverted towards carpet weaving the sculpturing talent in Kashmir’s predominantly non-Muslim population of yore. The Kashmiri artisans have been taking good care of the craft ever since. While the designs-in-fame still date back to the times of Shah-I-Hamadan, the artists also create designs on customers’ choice. “The designs in demand include that of the horses carrying a warriors on back; lovers Laila and Majnon and boxes. These patterns have come from Hamadan itself,” Shah says. “Sometimes people ask us to design a picture. We then give the picture to artist who draws it on paper with a labor of months together and then the process follows,” he says. The Kaleen is made into different sizes ranging from 1.5 by 2 feet table cover rug to 12 by 14 feet carpet for rooms. the price is determined by the size and pattern . For making the job easier, the weavers are known to have created the practice of singing aloud the pattern code: Chour deeath, zee anaar, threa makia, brounth kum paknaw, (4 white, 2 maroon, 3 lemon-move them to the front); akh deeath, threa sabaz, zee makai path kun paknaw, (one white, 3 green, 2 lemon-move them back). “Singing aloud reduces the chances of mistakes,” an aged weaver from old city, Ali Muhammad, said. With around 1.8 million tourists thronging Kashmir last year and the inflow expected to increase this year, the Kaleen has been high in demand of late. But it is not just the tourists who buy Kaleens as the locals nowadays too prefer the native art rugs over its cheap non-native variants. The people use it for floor matting, as prayer rugs and as wall hangings and other purposes. “…I feel Kashmiri Kaleen symbolizes our culture. We have decided to decorate our new house with Kaleen though it may take some planning given the high cost of Kaleen,” Irshad Ahmad Mir of Rawalpora in Srinagar says. In addition to Kashmir, the Kaleen is now available in most of India. With the development of e-trade, the buyers have the option to order it online from the merchants who have set up their own websites. In a bid to boost the carpet weaving art in the state, the government has recently set up Indian Institute of Carpet Technology recently. Apart from providing technical service and support to the regional carpet industry, IICT has been working for digitization of the art. “We are digitizing the traditional designs, which has made the work of carpet weaving easy, besides allowing the artisans to preserve the designs they create. With the introduction of digital technology the artisans are able to preview the product-to-be-made, which in itself is a great innovation,” Director IICT, Zubair Ahmad, said. The two decades of turmoil hurt the Kaleen industry in Kashmir as younger generation turned their backs to the art. 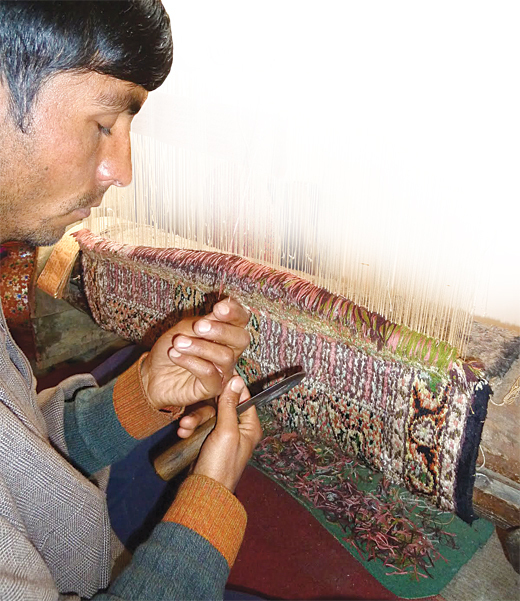 The younger generations of most carpet weavers have moved to other profitable businesses. However, IICT is trying to encourage youth to get back into the trade by offering diploma and certificate courses on carpet weaving.